If you feel severe heel pains while taking the first few steps in the morning, you may possibly be having plantar fasciitis and using orthotics will probably be the first thing a doctor or podiatrist will suggest to try to fix the issue. Apart from doing regular stretches, resting more often or wearing proper fitting and suitable shoes for heel pain, another way you can treat Plantar Fasciitis to use some over the counter orthotics or inserts with your shoes. Studies by Podiatrists have found that people who used orthotics reported that their pain had reduced by 37% after wearing them over a 12 week period. **Note: I review these further down the page if you need more information. Plantar fasciitis is a common foot problem which triggers heel pains and usually results from an inflamed fascia, which is a thick connective tissue band which covers the bone that lies at the bottom of your foot. Such an inflammatory problem could be triggered by a broad range of reasons. Because the feet carry the whole weight of the body while you run or walk, if you are overweight or are not walking properly, you may get inflamed plantar fascia. Those who are born with some structural foot deformities like high arches or flat feet may also have heel pains. The inflammation might also result from the use of inappropriately-fitting footwear. Whatever the cause of such a condition, the symptoms could be pretty distressing and we must look for ways of alleviating the symptoms. One of the most effective ways of treating this problem would be the use of the plantar fasciitis orthotics. The orthoses are designed to add additional support where your feet need it – specifically around the arch area. Most shoes have quite a minimal amount of support, so by using an orthotic, you will get additional comfort and rigidity where your shoes might be lacking. There may be some arch support or cushioning in your shoes, but over time, it get worn out. If you continue wearing the shoes, they may start to cause you problems with your feet. You may start to experience serious heel pains and might have a lot of trouble doing your daily activities. When you are asleep, the fascia becomes tighter, hence, when you take the initial couple of steps when you wake up, the band of tissue will stretch thereby resulting in morning heel pains. How do they help with plantar fasciitis? If you suffer from these sorts of foot problems, you must either put on shoes which are specially designed for plantar fasciitis or insert orthotic insoles into your shoes. Heel cushions, foot supports, or orthotic insole heel pads can also offer support to your feet. Foot support products are often created to deal with abnormalities that are linked to foot mechanics problems. Generally, they are recommended for people with gait abnormalities, high arched feet, flat feet, bone spurs, or bunions. The repetitive tightening and pulling of the foot arch and the resulting biomechanical destruction result in various foot conditions. Orthotics help in the reduction of over-pronation or over-stretching of the foot arch. Foot supports or shoe inserts reduce the tension on the ligament by ensuring even distribution of weight. These offer support to foot arches, ankle stability, and more importantly, cushioning and padding for improved absorption of shock. Unlike rubber foot beds which simply function as a cushion, the orthotic devices are created to correct any type of foot misalignment. These offer an enhanced foot function since they balance the biomechanical inadequacies. The use of such high quality foot inserts takes pressure off the foot arch and lower foot and arch pain. Do you need to buy custom orthotics? The first time I went to visit my podiatrist, after suffering from heel pain for nearly 6 months, the very first thing they suggested was to have some custom orthotics made. They went through the process of analysing my foot with a 3D scanner and then designing a pair of carbon-fibre and leather orthoses that would, barring a dog chewing them up, last me a lifetime. This sounded ideal to me – I was getting the right fitting inserts, specially designed for me – but the downside was the cost – £250! I paid for them and still wear them today, but there is a school of thought and scientific test evidence that proves that paying for anything other than an over the counter pair of orthotics, might be a waste of money. A study that has been published in the Journal of the American Podiatric Association (JAPMA) has shown that there is little evidence to support such expensive products, compared to cheaper options. Also, there are studies ongoing at the moment that are looking into the effectiveness of a pair of custom orthotics, versus a placebo pair – all of which leads me to believe that they are not as effective as my podiatrist made out.? Most of the evidence provided for their benefit is anecdotal, rather than hard facts and therefore it cannot be proven that they are more effective in treating heel pain and plantar fasciitis. Can you use orthotics when running? The short and quick answer to this is YES! However, when you start using a new pair of insoles, start by only running for a short time with them in. This will allow your feet to adjust slowly to how they feel. When you start wearing orthotics, you may begin to experience additional aches and pains as your body gets used to the new “gait” or different way you are moving. If you are running too, this effect can be magnified, making those initial pains worse. You may find that some running shoes have already got some sort of arch support insoles in when you buy them, but they can usually be removed and your orthotics inserted in their place. What are the best orthotics for Plantar Fasciitis sufferers? Before you read our recommended products, it is important to know that everyone is different – the products that some people say give immediate relief to their foot pains may also be ones that you struggle to even walk in. Like your fingerprint, each person’s foot and arch pattern will be different and therefore your needs will be different. You may need to try a few different products before you find the one that suits you best. Another critical point to consider is that you may not get immediate relief. If you have biomechanical problems, have a mis-matched gait or pronate when walking, these are issues that will not be resolved overnight, or just by putting some additional support in your shoes. Give the orthotics time to work – 2 weeks at least, increasing the time you wear them each day. Most manufacturers and suppliers have a good returns policy, so if they are not working, let them know! 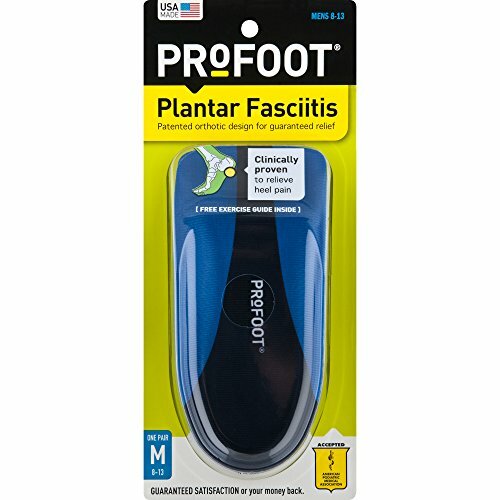 The Profoot brand is well known for helping people who suffer from painful feet and these orthotics are a great example of a reasonably priced but effective insole. Approved by the American podiatric medical association, this shoe insert is available for men and women and is designed as a one-size-fits-all product, so you won’t have to worry about getting the right size. However, you may find that many orthotics are too wide for narrow shoes or for people with slimmer feet. As with most orthotics, the Profoot is a 3/4 length, meaning it will only reach as far as the ball of your foot, adding “Vita Foam R XD” support to the heel and arch area, which is where plantar fasciitis sufferers need it most. They are also supplied with a small adhesive sticker that helps keep the orthotic in place, so they don’t slip around too much. Many people sing the praises of this brand and both men and women have gotten relief from their plantar fasciitis after using these insoles. Some people do complain that because of the sticky “dot” that is used to keep them in place, it is not easy to move them between pairs of shoes. However, at the low price, getting another pair may not be too extravagant (or just use some quality double-sided tape). Some of the complaints seem to be from people that have bought the Profoot, tried them for 20 minutes, found that they caused them more pain and then have given them up as “not working” or “unsuitable for people with heel pain”. As with any new medical solution, you need to give them time to work. If you have been standing or walking incorrectly for several months, you are going to notice a difference immediately – but initially that change may cause some additional pain. These orthotics from Sof Sole are slightly different to our previous recommendation because they also feature a gel based heel area, which will help reduce shock pain when stepping or running. The main arch support section is made from a bridged nylon plate, adding some firm support to the fascia, helping to prevent foot pain. If you suffer from heel spurs or plantar fibroma, the softer heel will be perfect to reduce any “heel-strike” pain. They are 3/4 length and are designed to work well in training shoes, sneakers or any sort of footwear you might use for sports activities. On the flip-side, they are also a good choice for people who are on their feet for a long time – the gel heel will help provide some additional comfort. Some buyers have commented that because they are 3/4 size, they can slip around inside your shoes – especially if you are running. Unlike the Profoot orthotics, these have no “sticky spot” to keep them in place – so bear this in mind if you have loose fitting shoes. However, the majority of the feedback is positive with some buyers saying that the Sof Sole Gel Insoles have fixed problems that 2 bouts of foot surgery couldn’t! Quite a bold claim, but having good shoes and using proper supports can make a world of difference. If you start to read some of the reviews of any orthotics, Powerstep Insoles is a name that comes up quite regularly where people have moved to using them, finding them a more effective product. This may be because they are a “full length orthotic” meaning that they provide support from your heel to your toes, whereas most other brands offer 3/4 size. If you read their marketing blurb, these orthotics were invented by a foot doctor and are the number 1 Podiatrists recommended brand. There have also been studies carried out with Powerstep users and the findings show that the majority of users experience significant improvements after 4 weeks (again – you need to wear orthotics for a while before you see any benefit). Along with manufacturers like Orthaheel, who also make products designed by podiatrists, this is a good sign that you are getting a good product that has been tested properly. There are a range of orthotics available (sold as color-coded options), all of which which help to treat plantar fasciitis and heel pain. There are also versions that specifically help treat pronation, heel spurs or bunions – so make sure you buy the correct model for your needs. Powerstep provide semi-rigid arch support area, meaning it will not be too hard and have a little “give” too – perfect for helping with arch pain. They are also saying that you will not need to trim the edges of this orthotic, which you may have to do with other cheaper, more “generic” options. I am not sure I would take a pair of scissors to my new insoles – but if it meant they would fit better, then maybe I would have to – but I shouldn’t! If you have ever had running shoes fitted in a proper shop, you will often be offered some custom molded inserts that they heat up and get you to stand on to fit your foot style. These orthotics from Corefit follow that idea, but in this case, you are heating them up by dipping them in hot water for 90 seconds first. 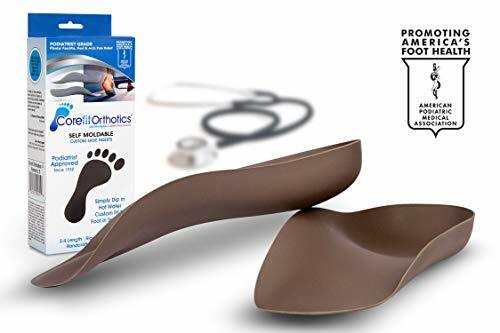 There are many reviews saying that these 3/4 length orthotics are very effective in helping cure foot pain, heel pains and even back and knee pain. However, I am a little dubious of being able to effectively fit these properly but at least you can reheat them up and refit them as many times as needed. Some people have said that they do start to sag after a few months, but refitting them again returns them to an as-new state. Corefit say that these are the same grade orthoses that are supplied to podiatrists and physicians and they have been approved for use since 1932. Unlike some of the other products I have recommended here, these are not covered with gel or padding to make your feet more comfortable, they are made from a firm plastic material which may take longer to get used to. Some reviewers have mentioned that they are too hard and can squeak in your shoes, which can be annoying for some – but if my foot pains were cured, I would not care too much about that. If you are looking for a product that will be perfectly and custom molded to your feet then these are a great, cheaper option than buying a full custom made orthotic from your podiatrist. 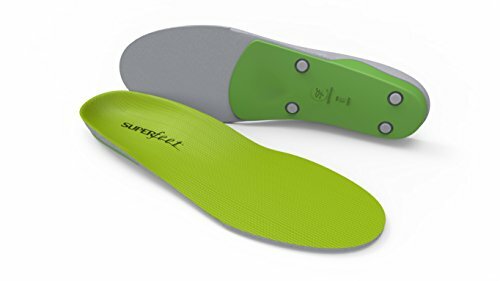 These orthotic arch supports by Superfeet have by far the most positive reviews on Amazon, despite them not specifically being made for helping plantar fasciitis sufferers (although it is mentioned that they help relieve this amongst other ailments). Superfeet make different grades of insole which are all color coded, but the Green model gets the most votes for helping foot and heel pain. This model has the highest level of arch support and is perfect for using in boots and shoes, so will work for most people. Remember, wearing good fitting shoes is key to recovery from foot pain – time to ditch those heels if you want to feel better. These are made from a high density foam layer, meaning that they are providing good cushioning for your feet, whilst still being soft and comfortable too. As well as having foot stability from the high arch support, they also offer a deep heel cup which will help keep your foot straight and prevent pronation. There are shoes to stop pronation available too. Many people who have bought these have stated that they prefer the firmer feel, compared to other products that use gel pads. They also say that a great benefit is that they work well in different types of shoes and are easy to transfer across, fitting well too. However, like with many other orthotic reviews, people also have reported issue with them not fitting properly, causing more foot pain and also being too hard (compared to other more cushioned insoles). There are no details of how long they were worn for before the user gave up, so I suspect that people were trying them, expecting an instant fix and when it did not come, they thought the orthotics were not working. Vasyli Orthotics – are they good? I love to see when people have a business where the motivating purpose is to help people and provide good quality products, rather than just take the money and run. Vasyli orthotics are made by Philip John Vasyli, a Podiatrist from Australia, who wanted to make orthotic shoe inserts affordable and accessible to everyone. 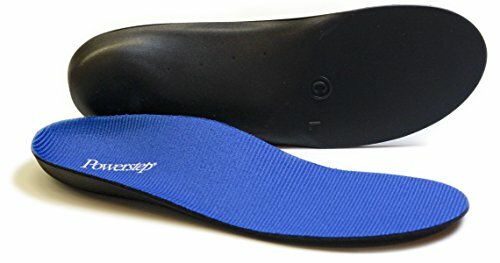 If you had to get a pair of orthotics to help fix problems with your feet such as plantar fasciitis or pain in the ball of your foot, it is recommended to have a custom pair created, by having your foot scanned or a cast taken to ensure that the orthotic is set up properly and specifically for you. However, John Vasyli created a type of orthotic insole that is adjustable, so that you are able to find the best fit for your feet yourself. This is done by inserting “plugs” into the bottom of the insole, that raises or lowers the height in specific places, such as near the arch or the ball of your foot. The fact that you can customise them is a great idea. As I said above, my custom made orthotics are definitely not 100% perfect, even though I had my foot recreated with a 3d scanner. I sometimes wish I could tweak them a little – so these Vasyli orthotics would be perfect for me. They come in a range of sizes and are suitable for men and women. As you saw in the video, the orthotics can be trimmed to fit your shoe exactly (using your original shoe insole as a guide) so there are no issues with the orthotic not fitting at all. 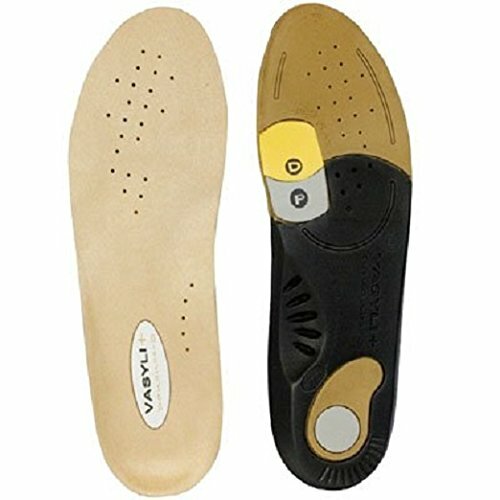 What styles of Vasyli orthotics are available? The Vasyli orthotics come in a range of densities, designed based on your weight or the type of foot, ankle or leg problem you have. There are also 3/4 length orthotics available where the main focus is on correcting the heel and arch rather than the front of the foot. but the recommended product is called the Howard Dananberg Orthotic shoe insert. The Howard Dananberg Vasyli orthotics are available to buy online from Amazon at very competitive prices and come with a lifetime warranty. Many people who have left reviews of these orthotics have said that they were recommended by their podiatrist or GP, so the fact that they are well known and respected is a very good sign if you are thinking of buying some. 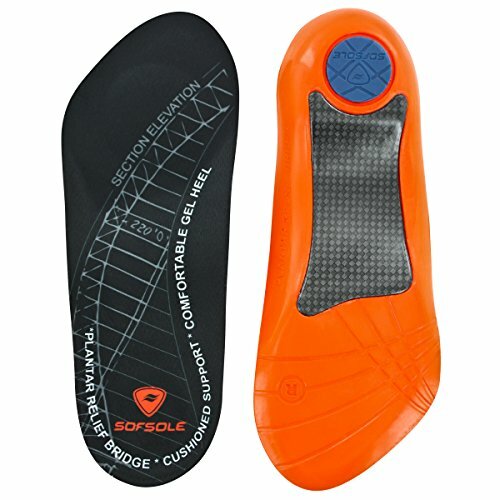 How do the Vasyli insoles compare to our other recommendations? Many other off-the-shelf shoe inserts are not as flexible as these Vasyli products and are not customisable at all, leaving you with an “all or nothing” product. I have tried some from Scholl and found that they were very uncomfortable. Using the heat method as shown above, it is easy to make these orthotics fit perfectly and support your foot in just the right places. Add to that the 3 adjustable “plugs” that can be inserted into the sole and you have a great way to provide excellent support for painful arches, heels and feet. Should I buy these orthotics instead? Although they might be slightly more expensive that other products you can buy online or from your local drugstore or shoe store, you really do get what you pay for in terms of quality and design. The fact that these can be customised is the best selling point for me. You are not just getting a standard one size fits all orthotic, you are buying a product that has been designed to fit your foot with the least amount of hassle for you. Yes, it might look like adjusting them might be a problem, but full instructions are given (including the video above) so there should be no problem fitting them at home.